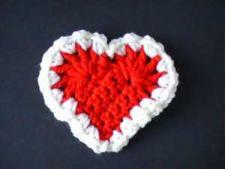 Crochet Red Heart: Make a crochet red heart today! The Crochet red heart craft project is pretty easy If you already know how to crochet. If you are a beginner then you should watch the youtube video. 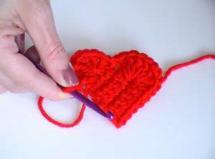 If you need help, watch the crochet red heart video. Anyone can watch the video and see how it is being done by someone else. You can subscribe to all of the videos by clicking here and subscribing. You will get an email notice when we put out a new video. Red and beige 4 ply used here. Hook: H/5mm is used here. 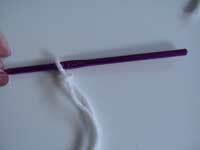 Step One: Create a slip knot and put it on your hook. Step Two: Chain 6 stitches. Step Three: Single crochet five stitches and add a stitch. Turn your red heart piece over. You will do this for a total of 5 rows. 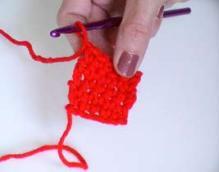 Make sure you are adding a stitch after each row. Step Four: Hold your piece up and look for the center point or hole, is approximately half way across your piece. You will be doing 6 dc, adding a stitch after each one in this hole. Again, if you need to stop and watch the video. Step Five: Slip stitch and count over three stitches and begin 6 more double crochet adding one stitch after each one. 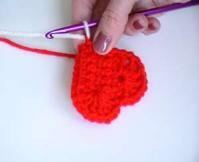 At this point you will be able to see the shape of your crochet red heart. Step Six: Slip stitch all the way down to the point of the heart. This is where you will change colors in order to put a contrasting edge or ruffle on your heart. Step Seven: Hold your second color behind your heart and use the new color and add a stitch, to change colors. Pull the red yarn tight and just leave it connected for now. Step Eight: Single crochet in each stitch adding one stitch after each one all the way around your heart. When you get to the top of the rounded part of the heart you can put your sc in between your dc stitches. When you get to the lower part of the heart that separates the two rounded parts you will only do a slip stitch in order to keep that part lower than the rounded parts. If you put a sc there it will throw your shape off, it will not look like a heart. Continue the rest of the way around the hear with sc adding one stitch until you get back down to the point. Step Nine: Once you have the yarn all the way back to the point of the heart you can either put in a slip stitch or a sc and you will be done. Congrats! You have completed the crochet red heart project! Tips: Keep your yarn loose, especially while doing the ruffle, or your heart might bunch up on you.